Cut throat shave the way with this replaceable blade razor. The razor is a close relative to the straight razor with the difference being that the blades can be changed, just like a safety razor. This means you don’t have to worry about stropping and sharpening yet enjoy the closeness of a straight razor shave. This razor uses standard safety double edge razor blades like Derby, Gillette 7 o’clock, Astra Superior etc. which are readily available in most supermarkets as well as online – a quick and simple process. ★ Carefully close the other side of the blade holder over the blade until the pins go into the holes. If the blade moves slightly at this point then push lightly back into position (but don’t use your fingers to do so as it is going to be sharp). Push the hinged cover back over the blade holder. A small portion of the edge of the blade should now be showing evenly. All Saaqaans products come with 100% money back guarantee, so if you’re not satisfied with our products or for any reason, you may return it in original condition (unused) within 30 days and get a full refund. YOUR SHAVE WILL LAST LONGER: When you use a normal safety razor, you need to shave every day. But using this razor your skin only needs to be shaven every other day. You will look cool and by using a straight razor you will impress most of your friends and probably also yourself. BETTER FOR YOUR SKIN: Three or five blade razors irritate the skin much more and you need to press it hard against your skin to use them. This is why this razor is so great and often using for better skin care products than the average shaver. Your face will thank you later. 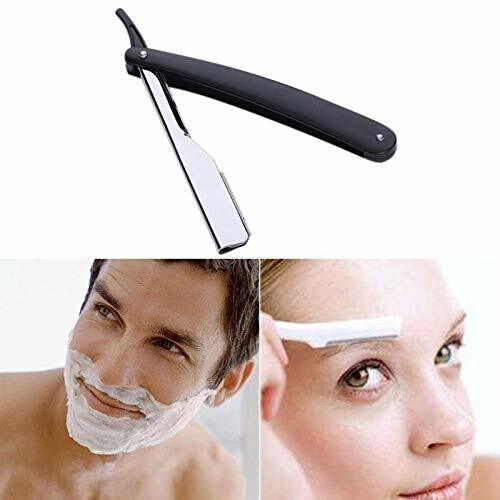 LOT OF BEARD TO SHAVE OFF: When you have a lot of beard to shave off, it is much easier to shave with this razor than other expensive razor because the beard gets stuck between the multiple blades razor and you often get a tugging sensation that irritates you. But with this razor you can go much closer to your skin without sticking. 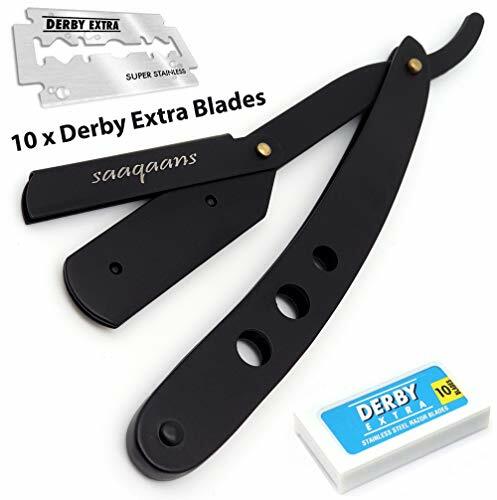 WHICH BLADES NEED TO BUY: This razor uses half of a double-edge razor blade so you can buy any standard double edge razor blades like (Derby, Astra, Gillette 7 O’ clock etc) which are readily available in most supermarkets as well as online. For blade installation please see below in the description. 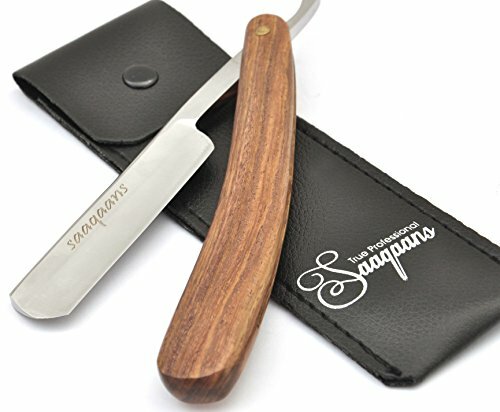 WHAT’S INCLUDED IN THE PACKAGE: You will get one branded straight edge razor with 10 x Extra double edge razor blades in a beautiful pouch with a manual instructions included in the package PLUS you will get FULL 30 DAYS MONEY BACK GUARANTEE in case if you are not satisfied with the product. This barber razor is of high quality,perfect for barbers,hairdressers,stylists, professionals,barber students or personal use. This Manual bears shaver is comfort in use, smooth and easily for traditional shaving. 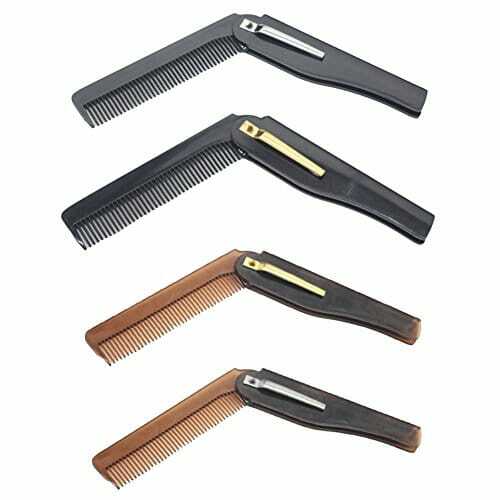 The 10 pcs detachable razor blade are made of stainless steel, which will never rust. The razor is shave ready and sharp enough, so that you will get smooth shaving experience. Hollow design is conducive to dry razor after use and inhibit bacterial growth. The balanced weight distribution of blade and handle makes the razor easy to control, it causes less vibration and is good for precise and detailed shaving. The thumb notch and ridges on the end of the blade prevents slip while shaving beard and mustache. This shaving razor kit is suitable for beginners, intermediates, and expert shavers. This is a Classic Men’s Straight Razor with Modern Grade men’s razor is the perfect men’s gift for Dad, Brother, Husband, Son, Groomsmen, or any other hard to shop for Gentleman.It is the perfect gift for a beginner, intermediate, or expert shaver. Our manual Razor provides you smooth and comfortable shaving experience, leaving you a neat nice look, makes you more confident with yourself. 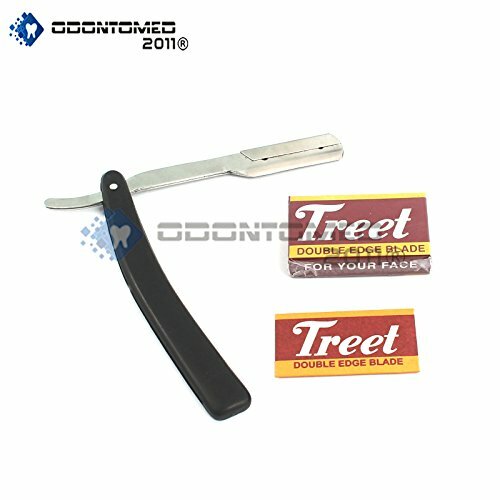 Professional stainless steel razor for barber & home, provide you comfortable and satisfying shaving. Pure wooden handle is high-qualified, classical and perfect into your palm. Replaceable blade design allows to remove and change a fresh one. Delicate appearance with exquisite details, more comfortable to hold. Perfect gift for Dad, husband, boyfriend or any friends. Compact and light in weight, convenient for business trip/travel carry. Note: Blade is not included. Made by high quality stainless steel, durable and practical to use. Cambered handle design makes it convenient to hold. Gap design can reduce water residue and inhibit bacterial growth. Lightweight and mini size, you can carry it in every feasible place. Suitable for barber shops, hair salons or personal use. 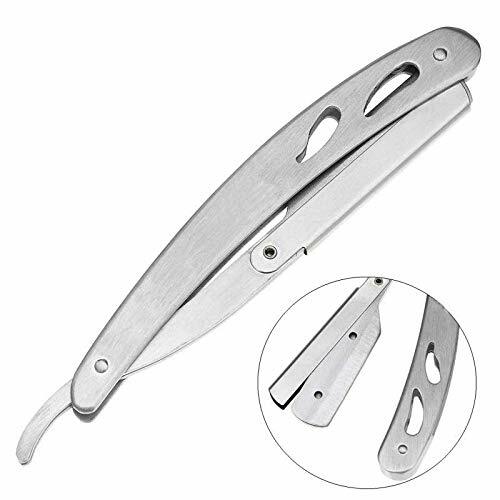 Professional Barber Manual Folding Straight Razor for Men: If you are tired of disposable razors and are wanting an even closer shave then these razors are for you. Included with the razor is a leather case and 50 free 7 O’Clock razors. These razors are perfect for men and beard care. BETTER FOR YOUR SKIN: Three or five blade razors irritate the skin much more and you need to pressit hard against your skin to use them. This is why the razor is so great and is better than the average shaver. Your face will thank you later. THICK BEARD? : When you have a thick beard to shave off, it is much easier to shave with this razor than other expensive razors because the beard will get stuck between the multiple blades of the razor and your beard will get tugged. Manual Folding Shaving Knife Beard Cutter Shaver Straight Edge Barber Razor Up to 22 Blades (Set of 11 Blades). Features: The razor is made of high quality steel material and the handle is made of platinum stainless steel, smoothly and comfortable. 270-degree rotation and humanized arc design, more convenient for you to change a suitable angle to use. 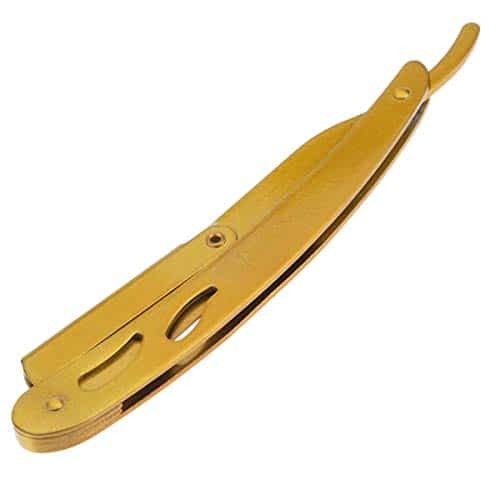 Classic straight edge razor. Suitable for barber shops, hair salons or personal use. Please keep it dry after using. 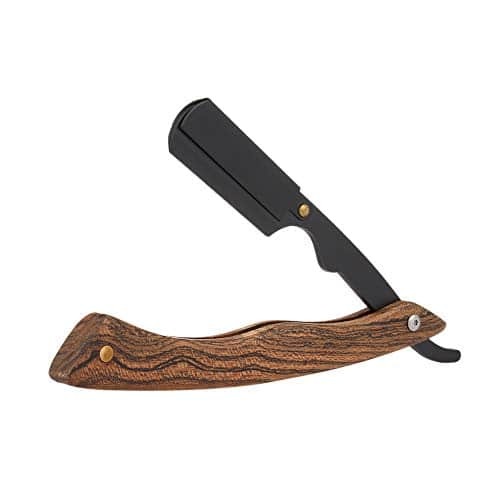 100% HANDMADE BUILT: This is a classic Men’s straight razor with modern appeal. This professional grade men’s razor is the perfect men’s gift for Dad, Brother, Husband, Son, Groomsmen, or any other hard to shop for Gentleman. 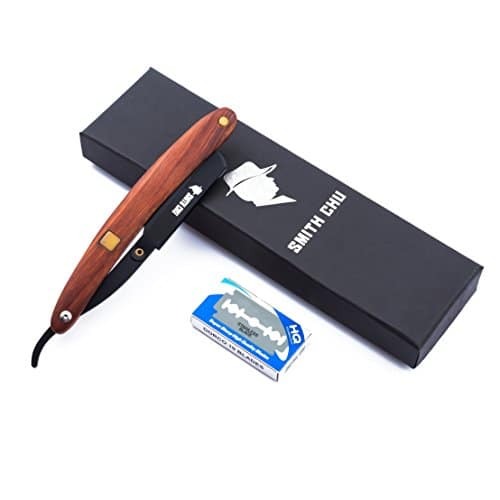 WHAT’S INCLUDED IN THE PACKAGE: You will get one branded Cut Throat Razor in a beautiful stylish pouch PLUS you will get FULL 30 DAYS MONEY BACK GUARANTEE in case if you are not satisfied with the product. OdontoMed2011® PRODUCTS OFFER A HANDMADE TOUCH TO EACH INSTRUMENT.